28 Marlborough is located on the south side of Marlborough, between Arlington and Berkeley, with 26 Marlborough to the east and 30 Marlborough to the west. 28 Marlborough was built ca. 1863, one of five contiguous houses (22-24-26-28-30 Marlborough) built as a single block, with a rusticated stone base at the first story with arched entryways and windows, and a heavy cornice at the roof line. Click here for an index to the deeds for 28 Marlborough. By 1865, 28 Marlborough was the home of merchandise broker Alfred Belcher Hall and his wife, Margaret Welch (Phillips) Hall. Margaret Hall’s brother, John Charles Phillips, Jr., lived with them. He was a shipping merchant in the East India trade. In 1864, they all had lived at 106 Chestnut. By 1868, the Halls had moved to 179 Beacon. By 1868, 28 Marlborough was the home of Henry Sturgis Grew and his wife, Jane Norton (Wigglesworth) Grew. They also maintained homes in Hyde Park and in Manchester. Henry Sturgis Grew had been a shipping merchant with the firm of Russell and Company, spending much of his career in Shanghai. After returning to Boston in 1867, he was an officer, director, or trustee of several banks and manufacturing companies. The Grews continued to live at 28 Marlborough in 1872, but had moved to 6 Park by 1873. On October 1, 1872, 28 Marlborough was purchased from the Augustus Thorndike estate by Dr. Benjamin Shurtleff Shaw, a physician. He and his wife, Amelia Copeland (Tribou) Shaw, made it their home. They previously had lived at the Massachusetts General Hospital, where he was resident physician. Benjamin Shaw died in May of 1893, and for the next three winter seasons Amelia Shaw was living elsewhere: during the 1893-1894 season at 165 Beacon with her son-in-law and daughter, William Endicott, III, and Helen Southworth (Shaw) Endicott, and then at 80 Beacon. During the 1893-1894 and 1894-1895 seasons, 28 Marlborough was the home of Dr. George Holmes Bixby, a physician. He was a widower, his wife, Anna Hartie (Dana) Bixby, who died in January of 1880, was the daughter of Samuel Turner Dana, who had been co-trustee of the Augustus Thorndike estate. He had moved from 28 Marlborough by the 1895-1896 season, and by the 1897-1898 season was living at 503 Beacon. 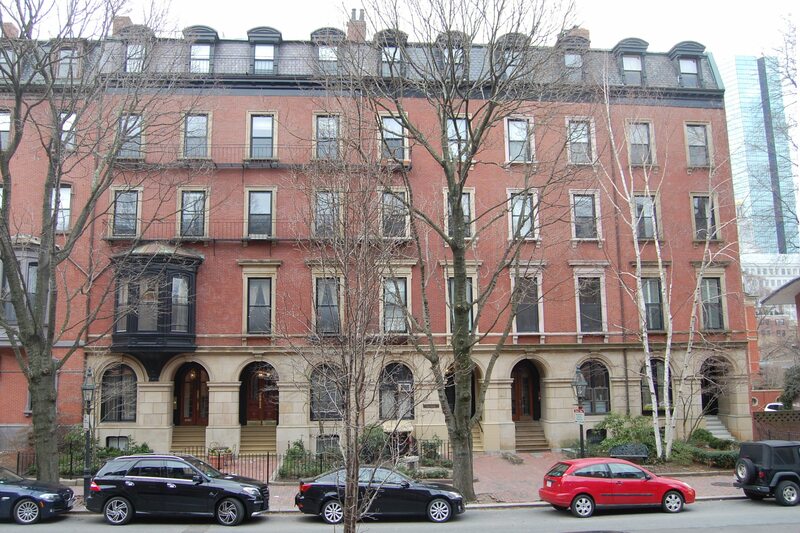 28 Marlborough was not listed in the 1896 Blue Book. By the 1896-1897 winter season, Amelia Shaw was once again living at 28 Marlborough. She continued to live there until her death in June of 1910. 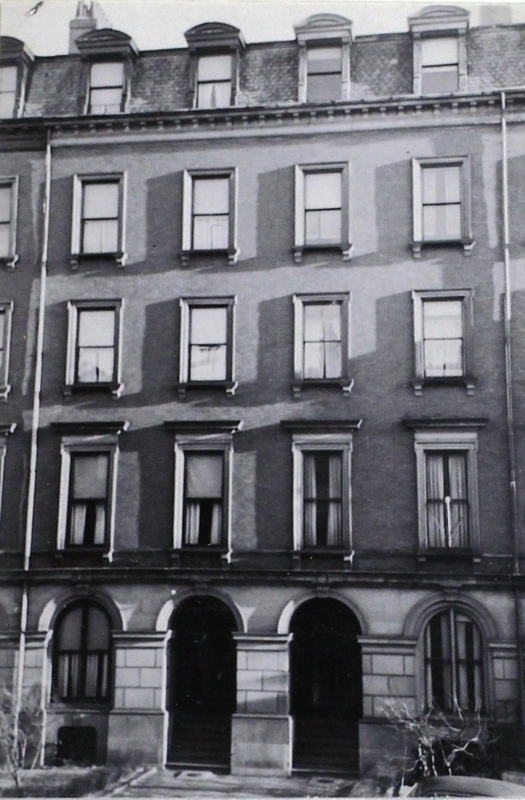 28 Marlborough was inherited by Benjamin and Amelia Shaw’s only surviving child, Helen Southworth (Shaw) Endicott. On August 15, 1910, 28 Marlborough was purchased from Helen (Shaw) Endicott by Maximilian Agassiz. He also maintained a home in Newport. Maximilian Agassiz was the son of Alexander Agassiz, developer of the Calumet and Hecla copper mines in Michigan, and the grandson of noted zoologist and Professor Jean Louis Rodolphe Agassiz. He appears to have lived on his inherited investments, and was known as a clubman and yachtsman. He was a major benefactor of Burroughs Newsboys Foundation, founding a recreational camp in Maine and providing scholarships to send newsboys to college. In September of 1921, he married to Laura M. (Maynes) Boyd. They had been engaged in 1913, but the engagement was terminated and she married a Mr. Boyd instead (the Boyds divorced after two years). After their marriage, Maximilian and Laura Agassiz lived in Brookline. 28 Marlborough was not listed in the 1922 Blue Book. On January 3, 1922, 28 Marlborough was purchased from Maximilian Agassiz by Annie Bartlett (Shaw) Andrew, the wife of George Clapp Andrew. 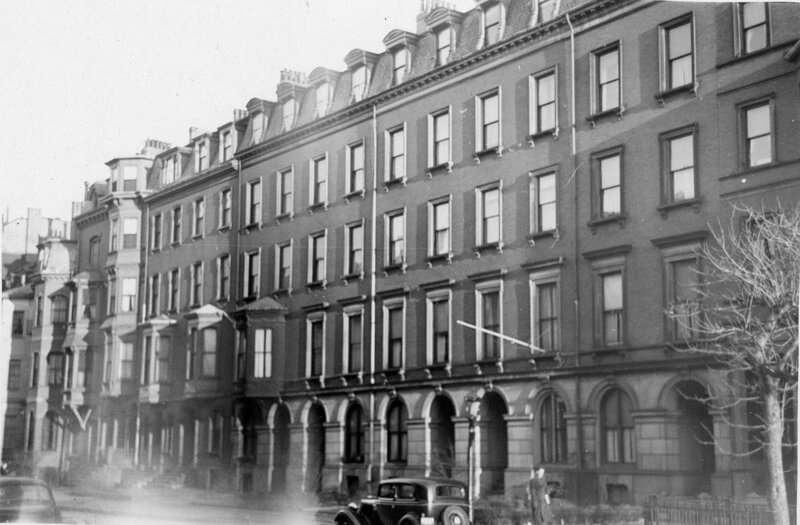 In its January 3, 1922, article reporting on the sale, Boston Globe noted that they would make it their home after “extensive repairs.” They previously had lived at the Hotel Victoria at 273 Dartmouth. They also maintained a home at Annisquam. George Andrew was a sales executive with a paper manufacturing company. George Andrew died in January of 1940. In July of 1940, Annie Andrew applied for permission to allow private massage to be offered at 28 Marlborough. The application was denied and the Board of Appeal dismissed her appeal. On October 3, 1940, 28 Marlborough was purchased from Annie Andrew by Tudor van Amstel and his wife, Marie Louise van Amstel. They were cosmetic manufacturers and previously had lived in Lowell. Marie van Amstel was a masseuse and it appears likely that Anne Andrew’s application to allow private massage at 28 Marlborough was made in connection with her sale of the house to the van Amstels. Tudor van Amstel was listed as Tudor van Amstel de Marillac in the 1941-1953 City Directories, and was called Tudor van Amstel de Serlac in a March 20, 1961, Boston Globe profile article. They continued to live at 28 Marlborough until about 1954. 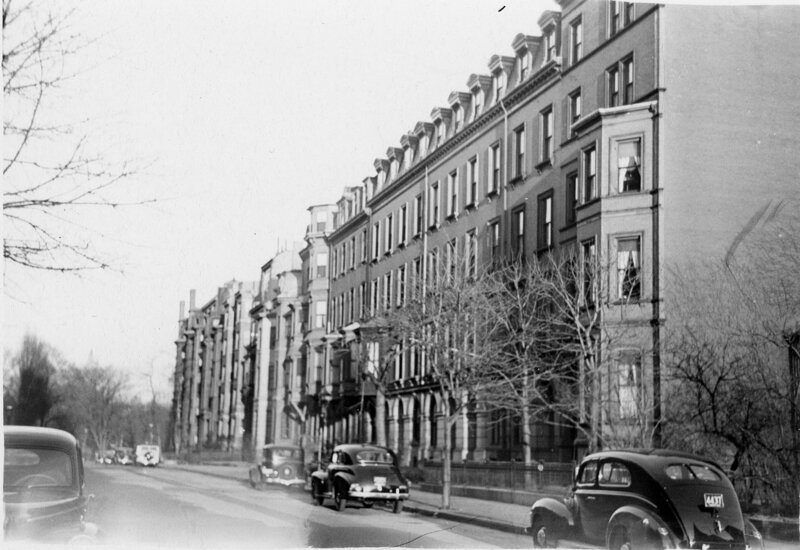 On January 7, 1954, 28 Marlborough was acquired from the van Amstels by Darius W. Horton and Russell T. Hamlet, trustees of the Twenty-Eight Marlborough Street Trust. In March of 1954, Darius Horton applied for (and subsequently received) permission to convert the house from a single-family dwelling into a two-family dwelling and lodging house. Darius Horton was a florist. He and his wife, Norma M. Horton, lived at 28 Marlborough and operated the lodging house. They had married in the mid-1950s. He previously had lived in an apartment at 57 Marlborough. 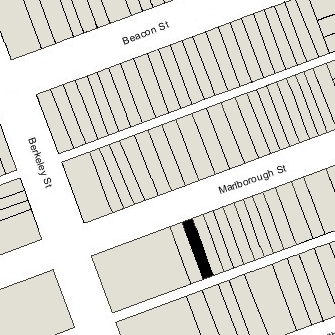 They continued to live at 28 Marlborough in 1960 but moved thereafter to an apartment at 349 Commonwealth. On April 12, 1960, 28 Marlborough was purchased from the Twenty-Eight Marlborough Street Trust by Myron Cornelius Fisher, Jr., director of corporate development for Fisher Junior College (founded by his father, Myron C. Fisher, Sr., and his uncle, Edmund H. Fisher). He operated it as a lodging house. He and his wife, Catherine B. (Schaefer) Fisher lived in Lexington but may also have maintained a residence at 28 Marlborough. In November of 1964, Fisher College applied for (and subsequently received) permission to convert the property into a dormitory. It continued to be a Fisher College dormitory in 1967. The property subsequently changed hands several times, remaining a multiple dwelling. On March 8, 1979, 28 Marlborough was purchased by Robert J. (Bob) Vila, a contractor and restoration specialist who, from 1979 to 1989, was host of the Public Television series “This Old House” about the renovation of vintage homes. In April of 1979, he applied for (and subsequently received) permission to convert the property from a two-family dwelling and lodging house into four apartments. 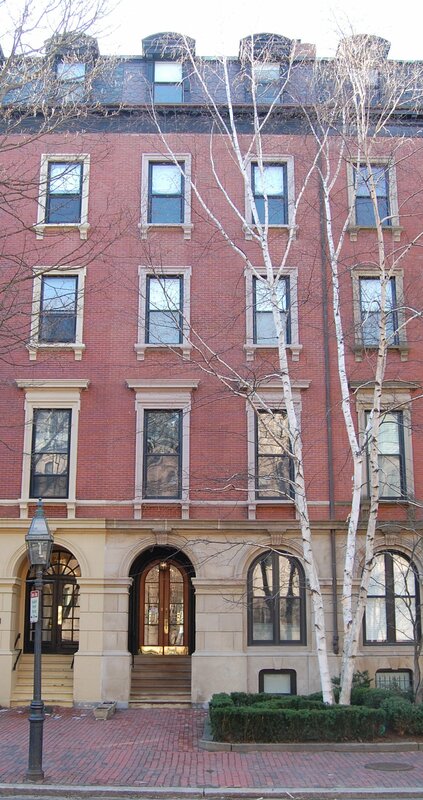 On July 5, 1979, he converted the apartments into four condominium units, the 28 Marlborough Street Condominium.